Jazz is still predominantly the music of the city, but some English shires have more to offer than others for the rural jazz fan looking longingly at the London listings but dreading that drive down the M1. Editor-at-Large Peter Bacon looks at what's coming up in the Shakespeare county. The little, local, volunteer-run jazz club is alive and well in Warwickshire, where there are regular gatherings in Stratford-Upon-Avon, Kenilworth and Leamington Spa, as well as a refreshed jazz programme in the county's prinicipal city, courtesy of Jazz Coventry. There are big-name visitors next month in the form of vocalist Norma Winstone and saxophonist Tim Garland. And the summer 2017 gig list for Stratford is looking particularly impressive. Norma Winstone will be the guest of Warwickshire regulars Interplay, led by bassist Adrian Litvinoff. 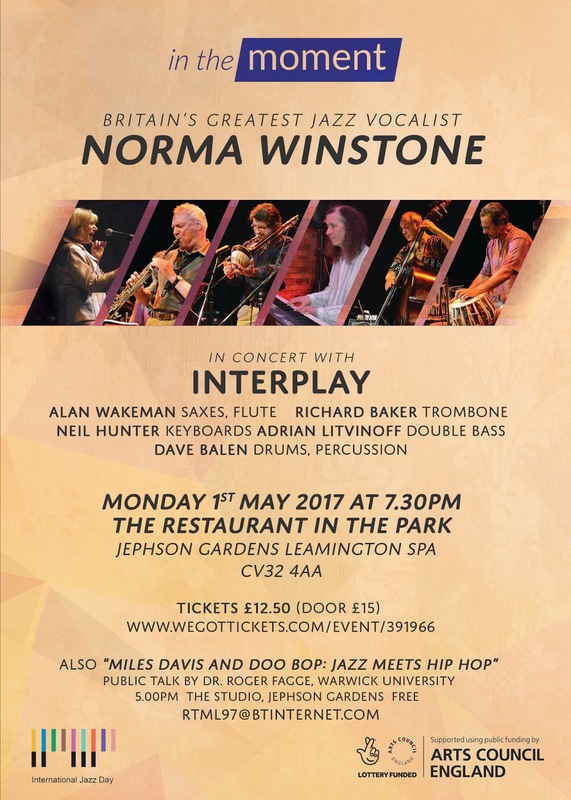 The group play on International Jazz Day which is also Bank Holiday Monday - 1 May at 7.30pm at The Restaurant In The Park in Leamington Spa's Jephson Gardens. In addition to the Norma Winstone concert, there is a free public talk before the concert: Dr Roger Fagge, Associate Professor in Comparative American Studies, will be exploring Miles Daves and Doo Bop: Jazz meets Hip Hop at 5pm in The Studio in Jephson Gardens Glasshouse (no stone throwing, please!). Meanwhile, just down the road on Friday 19 May, the Kenilworth Jazz Club (KJC) will be presenting the Tim Garland Electric Quartet. This concert is given in association with Kenilworth Arts Festival and will be the first jazz gig in the newly refurbished St John's Parish Church in the town. KJC's David Logan says the church has had major modernisation with new seating, flooring, sound and lighting system - it might be a modest parish church but "it is a credible venue". 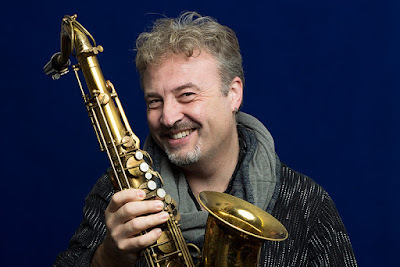 Later in 2017 Kenilworth Jazz Club will be presenting a solo concert by Gwilym Simcock during the the main Kenilworth Arts Festival week. The Stratford Jazz Club celebrated its 30th birthday last year and is currently well ensconsed within Stratford ArtsHouse, though this year is expanding to include Riverside a little way along the Avon in Tiddington. On the horizon in their fortnightly Wednesday evening gigs are: Alison Rayner Quintet (26 April), Jean Toussaint (10 May), Laura Jurd's Dinosaur (24 May), Kieran Garrett feat. Dave O'Higgins (14 June) and Jay Phelps (28 June). At Jazz Coventry, which has said a sad farewell to one of its founders, William Shaw, who died earlier this month, the upcoming Thursday programme at its regular venue The Albany Club includes: the Dave Newton Trio with guest Nat Steel (29 April), the Annie Whitehead Quartet (25 May), and the John Etheridge Blue Spirit Trio (19 October). Very sorry to hear of the passing of William Shaw who did a great job enthusiastically promoting jazz in the area for many years.